In an alley in New York, a bum and his dogs are startled by the electric lamps around them suddenly and mysteriously going haywire. Beneath the streets, however, the cause is obvious: the Turtles and Casey are having their final, climactic battle with the cyborg Baxter Stockman, blowing his robotic body to Kingdom Come. 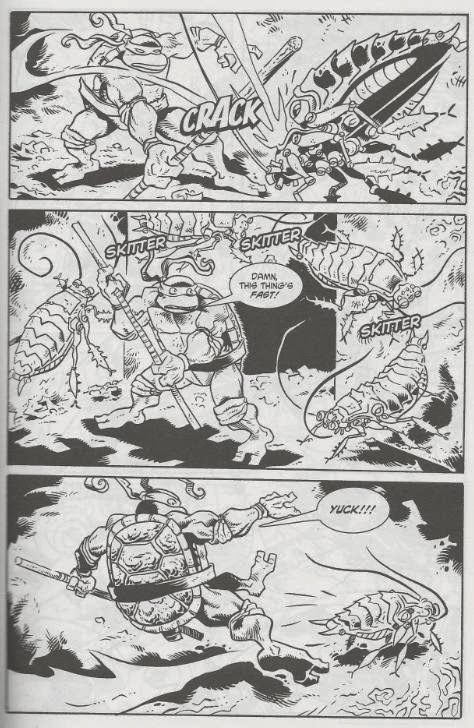 The Turtles gather up Baxter’s pieces and Leo instructs Don to dispose of them all. As Don rounds up the remains, he fails to notice a glob of goo slithering away. Once out of sight, it absorbs a nearby cockroach. 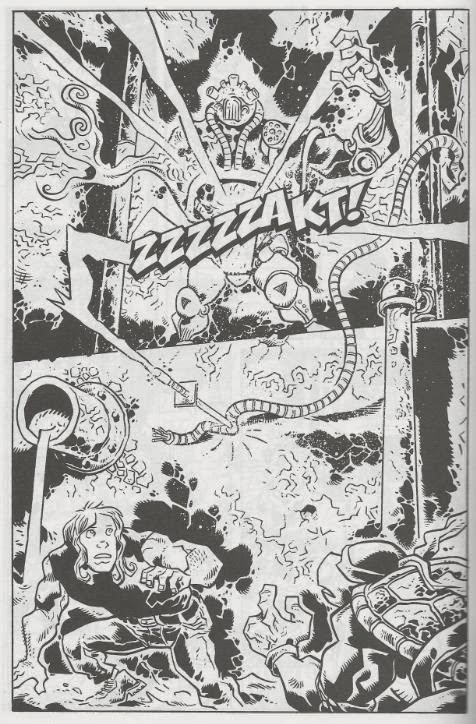 In a secret lab in the sewers, Don succeeds in bringing Baxter Stockman’s cerebral functions back online, albeit trapping him in a few scraps of his robot body, strung up on the wall. Baxter wishes to know where he is, but Don has only one topic on the agenda: Raph’s location. Sometime later, Don begins taking inventory of the pieces to Baxter’s robot body and discovers there’s no right arm. Curious, Don runs off. Elsewhere in the sewers, the cockroach has become larger and more…robotic in appearance. It absorbs a power box and grows even bigger. Don returns to the scene of their battle and recalls that when they fought Baxter on the roof, his right arm had been blown off. When they fought him in the sewers, however, his right arm had grown back and with a somewhat organic appearance, too. Don begins to ponder if Stockman might have invented a robot that could regrow appendages. He takes a device out of his bag and begins to follow its beeping until it leads him to a strange drop of goo. The goo appears to be an autonomous liquid metal. *This issue takes place right after TMNT (Vol. 2) #9, where the Turtles destroyed Baxter’s cyborg body. This story will continue in Donatello: The Brain Thief #2. *Raph was thrown from the top of a building by Baxter and kidnapped by D.A.R.P.A. in TMNT (Vol. 2) #8. The fourth and final TMNT character-themed miniseries begins here. I wasn’t too enthused with the previous three (though “The Third Kind” was alright), but this one actually had me pretty excited. The reveal in TMNT (Vol. 4) #9 that Don had morbidly kept Stockman’s brain in a secret lab in the sewers for years was one of the volume’s better twists, though it was more or less ignored as soon as it had been brought up. 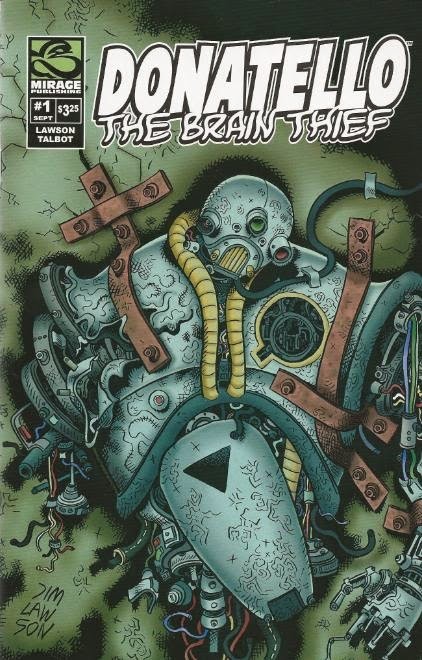 “The Brain Thief” looks to cover that plot point, which is something of a relief, since it always seemed to me like it was something too important to ignore for over half a decade. While I like the idea, I’m a bit wary of the execution. Jim Lawson seems to be going for the “manga-style” of extremely decompressed story telling which I’m not so sure I like. There’s a balance that needs to be struck between plot and pacing; you don’t want to cram too much story into too few panels, but you don’t want to spread a simple plot point out over so many pages that the reader feels like they received little for their investment. Lawson doesn’t manage to strike that “just right” note with this issue, and you end up reading the whole thing in four minutes tops. There are pages meant to build tension, but wind up simply wasting time. Did the hobo and his dogs really need to absorb the first four pages of the issue, when all they were there for was a set-up for Baxter’s explosion? I mean, it’s the sort of thing that works on a cinematic level, in a movie or what have you, but you’ve got to be a little bit more frugal with your page space in a comic book. The overall lack of dialogue makes things even breezier. In the end, after 28 pages, I feel like I only read half a comic book. I imagine it’s one of those things that’s intended to “read better in trade”, but I’m reading it now, so that excuse doesn’t exactly fly. Ah well, I’m still genuinely interested in seeing where everything’s going. but it was a Robo-Roach. maybe the nasty-factor gave it the advantage to throw Donnie off his game? Did this roach inspire the nick figure/episode "Cockroach Terminator"?